So I just finished Bioshock Infinite and I feel I need to write something about it. There is a lot that is really good about the game, but the way it all comes together seems like a wasted opportunity. This does not mean it is a bad game, far from it. I played the entire game in a couple of days, a rare thing for me, and had (mostly) fun doing so. What really stuck to me, though, is how it abuses its own premise. The capability for true greatness can be seen throughout, but is constantly hindered . This is also why it is so interesting to talk about it. By taking a closer look at Bioshock Infinite we can perhaps learn to harness its dormant potential. Before we get into it all, I need to clear up a concept. When I talk about the narrative in a game, I see it as the totality of the experience. It is not just cut-scenes and audio-logs that make up a narrative, it is also the shooting, jumping, and all other actions that I perform as a player. While not that many talk about narrative in this way, I think it is really how most of us interpret our experiences. When we take part in interactive storytelling, what we really care about is our activities and the scenarios. While we of course are able to talk about the narrative in a separate, dual world-like, sense, it is not how we live through the experience. We do not absorb gameplay on a purely abstract basis, we connect it to the game's virtual world and incorporate it into our subjective narrative. The journey we take through the game becomes our narrative. We want to play the story. I think this is true for anybody who has interest in a videogame storytelling. I see this as the gold standard for any work of interactive fiction, and it is through this lens that I will inspect Bioshock Infinite. First up, I will go over the combat. I am not fond of combat in games, mostly because it is so overused, but when done well I have nothing against it. The grandfather of Bioshock Infinite, System Shock 2, is a great example of combat done right. Every enemy conveys an aspect of the story, the flow complements the overall mood and the tactics are connected with the progression of the protagonist. When fighting in System Shock 2 an engaging narrative is created; one that ties neatly in with the rest of the story elements. On the other hand, Bioshock Infinite's combat has probably the worst narrative connection of recent memory. It is basically on the level of Smash TV; arena like battles where you need to kill all hostiles in order to progress. Enemies just run at you and attack, lacking any of the awareness-state nuances seen in previous Shock games. It all boils down to a hectic and often chaotic spectacle. While it can have some charm, it very rarely creates any sort of narrative experience. It is just a matter of clearing waves of enemies in order to move the story forward. Worse still is that the elements of the battles have little to do with the story. Enemy fiction does not get any better than them being the henchmen of whichever bad guy happens to be your current antagonist. The same is true for your powers. The different magical spells acquired seem to be there simply because they were present in the previous game. They get mentioned on some billboards at the start, but serve no further narrative purpose. Like so many other things in the game they are there just to comply with the predefined combat mechanics. The game also features looting and vending machines, elements that seem to belong in neither in combat or the story. Yet again these elements are there because they were in the previous game. Possibly also for fear that the player might get bored. To me the overall impression is just one of disconnect. It is a clear example of how much the little touches in earlier games mattered. Combat in System Shock 2 is probably a lot less complex than that in Bioshock Infinite, but because it ties neatly into its fiction, the emergent narrative is so much more engaging. By having this detached fighting system, a very interesting question is exposed. 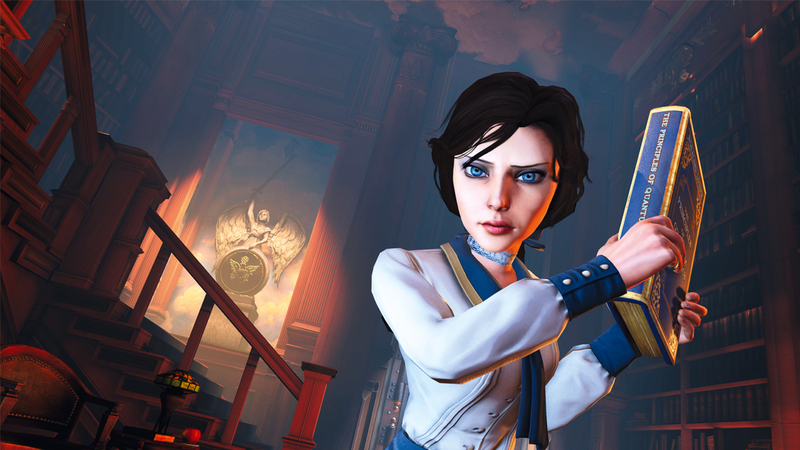 Does Bioshock Infinite need combat at all? The problem is so obvious that many mainstream outlets have picked it up, something I have never seen before. But before this issue is dealt with, there are other things to discuss. I will now go over the different ways in which Bioshock Infinite chooses to tell the story, and point out the many problems that it has with its story's basic constituents. The first thing to note is how the combat design spread to and corrupt other parts of the game. When in combat mode most of the normal storytelling bits go away, but when leaving a combat arena many of the combat mechanics still remain. The most obvious of these is the looting. In System Shock 2 this made sense, but in later installations it has been simplified and lost much of its narrative connection. The problem peaks in Infinite, where it boils down to mindlessly searching and emptying any vessel in sight. Searching objects would be used to contextualize the backdrop, but it does the opposite here. Much of the scenery is turned into power-up containers. This cheapens exploration, giving it a mechanical and forced feel. All these problems get so much worse when the contents of the loot directly contradict the surrounding environment; for instance, starving children standing next to barrels of fruit. The insistence to place coins everywhere is a similarly damaging feature. Adrian Chmielarz has written a very revealing article of how these elements infest the very beginning of the game. Vending machines that turn up in strange places and magic potions thrown about are all also hard to mold into any sort of narrative. But perhaps worse of all is how the combat ties into, and corrupts, a major character and theme of the game. For most of the journey the player is followed by a young woman called Elizabeth. She comments on scenery and keeps the narrative going.The game shows how having a character that stays out of the way, and manages herself, makes her a lot easier to get attached to than one who is in constant need of attention. When not in combat she is a great companion who has her own personality, feels like a fluent part of the game and is of great narrative importance. It is really something to take notes from. But when in a fire fight, which is the bigger part of the game, she is reduced into a power-up dispenser and portable lock-pick. I guess the intention was that this would help the player bond, but because it happens so often it just dispels the illusion. As the game passes, she turns more and more into a gameplay device, and less of a living individual. Another prominent feature of the games fiction is the existence of parallel worlds. Elizabeth is able to peek into these, opening tears that can let objects travel between dimensions. This is an intriguing concept and something that should be possible to explore in an interactive story. As it turns out, except for a few rare occasions, the only real interaction with these tears is during combat. They are simply used to conjure up generic objects, all used for their mechanical gain only. Here we have a feature that could have had an almost limitless array of exploration opportunities, and it is used solely as a gimmicky combat tool. While Bioshock Infinite paints a breathtakingly beautiful world, it is all on a "look, don't touch"-basis. The code governing the game's plentiful NPCs are on par with an old school JRPG. They are all static automatons waiting for the player to show up so they can deliver their one canned response. This is especially jarring in a detailed first person game where objects can examined so closely. I think that even the slightest AI improvement, such as moving out of the way, would help tremendously. The rest of the scenery follows the same formula. Apart from a few, and often rather boring assets, the world is static and void of interaction. It is evident that most code complexity has gone into the combat mechanics, instead of features that give rise to narrative. Building from its pedigree, the game is of course loaded with audio-logs. The System Shock games handled this quite nicely and tried to fit them into the fiction. It has since been abused in many games, and I have to say Bioshock Infinite is one of the worst examples I have seen. The reasons for recording are dubious and, worse of all, the placement is awful. For instance, you can find personal recordings of the city's ruler lying on the table of a crowded cafe. After the game literally smashes a book about Quantum Mechanics in your face, you expect the technology to at least be somewhat justified. This would also make sense as the game has plot aspects that encourage thinking about similar topics. Older games in the series have at least tried to do this; making sure that creatures and contraptions form a coherent whole. But in Infinite, almost nothing is explained. I am not saying there needs to be an in-depth explanation, but it must at least seem plausible in the fiction. When the game is so dismissive with most of its story elements, it is hard to give anything a deeper consideration. This directly counteracts the intended deep themes of the game. Also worth noting is how simplistically written the characters are. The game paints a backstory and world that could allow for really elaborate discussions. Instead we just end up with villains without much depth. The game simply points out that both sides can be evil, and that is it. It is a shame, as these kind of worlds are often great ways to explore many social issues; China Mieville's books being excellent examples. What we arrive with is a game that does not seem to take its fiction seriously. It builds up this extraordinary backdrop but never makes any attempt to pull it all together or make any deeper explorations. It seems content with being shallow. It really is a shame. I will now drop the specific details and talk about the narrative experience as whole. Here I think the flaws show up even more clearly. I can forgive that specific elements make little sense, but I find it much worse when a game lacks a clear ambition and focus in the way Bioshock Infinite does. It seems obvious that the narrative has not been intended as the main source of engagement During most of the game understanding and enjoying the story is not of importance. There is always an arrow telling you where to go, combat encounters are frequent and there is ever present loot to be found. The game never relies on you being caught up in the narrative, but makes sure that you are constantly exposed to the core gameplay loop. Despite this, the story is a very big part of the game, the world reeking with narrative elements. It seems like the game is not sure what it wants. It tries to do two very different things, and end up doing neither particularly effective. It feels like an attempt to tell a serious story through a theme park ride. The game tugs you along these fantastic, but mostly lifeless settings; often stopping to engage you in some repetitive activity. It is hoping that the sheer spectacle of the ride and constant feeding of candy will make you forget all of its short comings. Because the game is such a straightforward ride, there is never any proper thematic exploration. There is a lot of things to discuss after a play session, but nothing of the sort happens during actual play. An engaging narrative never emerges, and the good things left are punctured by unrelated activities. Because of the game's insecure nature I am forced to constantly doublethink. I need to neglect certain elements, forget what I have heard/seen and toggle my view of the world. When in smaller bursts, one can often see past this. For instance, it is possible to feel part of a play even though you know it is just actors on a stage. But when the conflicting elements are so interconnected and frequent it just gets harder and harder to ignore. In the end, the only way for me to go on was not lose myself in the fiction at all. I had to take it all in on a very superficial level. The doublethinking just became too much. It was still possible to enjoy the game, but all along it was evident that a lot was missing. To me, Bioshock Infinite stands as a clear example of how a lack of focus lessens the emotional impact. Had the game just made sure to set a firm focus on telling a story, it could have been so much more. I am having the same kind of feelings I had after playing Dead Space 2; the feeling of unlocked potential, that the developers just did not dare to take the game were it should have gone. I hope that people playing Bioshock Infinite will see this and take note. Back to the question I asked earlier: is combat needed? This is something that has been uttered by many: that the violence is detracting from the story. This is response is awesome, and I cannot recall the issue being raised in this way before. But at the same time, I have not seen any good examples of what to have instead. This is what I will talk about here. First of all, note that the combat does not need to be removed. It is possible to have a narrative focused game with a lot of fighting. System Shock 2, or whichever other immersive sim, can be checked to see how it can be done much better. That is not really that interesting though; it seems much more rewarding to see if we could do away with the core combat gameplay all together. Having any sort of cognitive demanding activity has been shown to decrease our capability to feel emotions. Not having combat can heighten the sense of empathy and connection to the characters. Avoiding combat removes the tunnel vision that comes with it. Competitive fighting makes players focus on a very specific activity and make it easy to ignore other aspects of the game. The world's non-combat features come to a stronger focus if combat is dropped. As I have argued at length, the common combat design drastically decreases the set of actions we can let the player do in a game. If fighting is removed more actions can be added for the themes we want to explore, actions that will make the player think more deeply. This is of course not something a major studio would consider doing. The most obvious reason would be that it is hard to market and sell. This might be true, but I think there is another reason that lurk beneath. Many designers are simply dead afraid of the player getting bored. When a game is missing a "fun" core loop it gets extremely hard to test. Some experiences are only possible to be engaging to a fresh mind and cannot be easily evaluated by its creator. It is not possible to get simple objective feedback data. One has to rely on gut intuition and, dare I say it, create art. Adding more involvement from Elizabeth. Let the player choose what space to be explored and then let Elizabeth act out there. She can be a sort of extended interactive force. Early trailers had Elizabeth playing with masks for instance. Why not take more advantage of the tears. Let the exploration of tears be a main pull throughout the game. Since we are visiting worlds that are slightly similar to the one we are in, there are all sort of thought provoking things to add here. Again early trailers already showed some of this. While we are at it, why not use tears instead of the audio logs. It would make a lot more sense. Add more direct interaction with the people and explore the themes through that. For instance, the player could find food but not enough to go around, if you give it to a kid his friends might jump on him and fight over it, etc. I do not want to sit on a high horse here and proclaim how I would have saved Bioshock Infinite or something like that. The above are just simple ideas on top of my head. I am just trying to show the avenues that open up when we let go of that core loop and focus on narrative delivery. The above is not that hard to do; probably a lot easier than it was to do the combat code and assets. It is just that it requires a new kind of thinking. As early trailers show, the idea was already there but something, probably the urge to make combat work, led away from it. In one way it felt weird and annoying to play Bioshock Infinite. There was a constant bombardment of things that I found obviously wrong. Despite this the game was given perfect scores all over, the many imperfections swept under the rug. But then I saw the articles that followed, discussing aspects of a game I have never seen in the mainstream before. This makes me hopeful that we are onto something here. I am unsure if any larger studios will change, but I think the game has opened eyes of many. This might also be where all those high grades are coming from; the sight of this enormous potential; the thought of what videogames could be. That is at least my sincere hope. Great perspective. Always opening my eyes to new ways of thinking. Really a beautiful review, and I agree on almost all points. "Removing any sort of cognitive demanding activity has been shown to decrease our capability to feel emotions." I think you mean INcrease here. You're talking about the report in Inquisitive Mind, right? Great blog post. I agree with the whole thing. I think, when everything is said and done, that Bioshock Infinite will stand as one of the most important works of this generation. Not because it's brilliant, but rather because it's _not_. It will be known as the game that finally exposed the limited and damaging mechanics of the shooter genre to the broader public. And in that sense I'm happy. It's tough to swallow at the same time though. There are genuine ambition in large parts of the game. It's a game you'd want to succeed, because it had the potential to change something. Unfortunately Ken Levine was busy catering to the masses. The most annoying thing about Bioshock Infinite, for me, is that it has no integrity. I can forgive poor mechanics if they still point in an interesting direction, but I just can't respect the way the game is selling out its soul. Really good blog post and I feel exactly the same when I was finish with Bioshock infinite. THey begining blew my mind but the combat and such just was not ehh.. good after a while. 1. Your notion of the tonics being dislocated from the narrative is demonstrably false. It is made clear that the tonics were developed based on Rapture's plasmids. Fink had observed Rapture through a tear. This is also where the prototype for the Handymen originated: Rapture’s Big Daddies. This information was relayed through an audio log. I agree that the audio logs are placed in strange locations, but, given the bizarre and high comedic style of much of the rest of the game I did not find this disconcerting. Moreover, that such essential information as the aforementioned can be learned from these audio logs proves that they are not ancillary to the overall narrative experience. Most of the questions which an inattentive player may have at the end of the game can be answered through deeper exploration and more careful consideration of the information provided. You might argue that this information could have been more smoothly integrated into the core narrative, but I would argue that such an integration would run counter to the narrative methodology of the Shock series which has always required players to put in some extra effort in order to learn the whole story. This philosophy informs the rest of the game. When you boil it down, Booker DeWitt is slaughtering his way through legions of Columbians, people who trusted, obeyed, or reviled him, as Comstock. This is important. The single-mindedness of Booker’s quest is in a sense as deranged as the other Booker’s quest. He is, it seems, above all else a killer. Make sense that he would be doing a lot of that throughout the game. Certainly there are criticisms to be leveled at the combat itself, but not merely at its being present in the game, or even prevalently present. The execution of the combat ought to be thoroughly critiqued and examined (I enjoy it personally, but recognize it as flawed) but it is a necessary part of the narrative and not disconnected from it. War is a part of either Booker’s past, and, in a face-off between two versions of the same man, both soldiers and thugs, it makes sense that such would be the discourse. 3. The lack of NPC interaction was disappointing. I entirely agree on that point. It often felt strange to walk through these alien environments surrounded by people who barely noticed your presence. In particular, the players inability to express empathy for or offer assistance or understanding to the downtrodden citizens of the Columbia had a dampening effect on my sense of agency and morality. But, leading into my final point, that was the whole idea. I think the difference is that you have evaluated most of the game ad hoc. As I said, the lens which I viewed Infinite through was that of narrative emerging during play, not narrative has some sort of construction afterwards. This might seem as if setting rules and making all my points automatically valid, but that is not true. It is a pretty wide scope I set up and something one has to do to properly discuss it. I think that when judging the narrative qualities of a game, we should discuss what the game tells us as we play it. We should focus on the feelings has the actions happen. If we just let anything of a game become a narrative, it soon become meaningless. For instance we could talk about how sing star has a great story because you have such a good time with your friends and meet new people as you play. Most of what you say sounds a bit lite modernist art critique, where one goes to great lengths to make something seem meaningful. I find this problematic as it can make any work seem meaningful if you just view it the "right way". Most of what you see as greatly tied into the game, I see has sloppy hatch work slapped on in the last minute. The reason is that I could not possibly get anything from it until I had played through the game, and for much of it, not even then. I really take issue with your last paragraph. You're just as guilty of looking at the game from a certain perspective and claiming that if we just look at it the "right way" we'll see that it really isn't meaningful. It's a terrible way of ending an argument. He raises some legitimate points and backs up what he says with citations from the text, as it were. You can't just dismiss that. I also think you're wrong to claim that he's simply constructing a narrative himself. His arguments about the powers, handymen, and the role of violence all have explicit roots in the game, as it is being played. I'm sure, based on the quality of the editorial, that you're capable of more interesting counter arguments than that he's not looking at the game right. 1) Small parts of the game. For instance, compare the very minor reference about handymen to the background and importance of any hostile character in Bioshock 1. Just because a small note explains the existence of a character, it does not mean it plays a role in the story. 2) Things that are "made up" afterwards. Like the theme park-like environments being intentional, which can only be appreciated by making certain thematic connections after having played the game. Also, these things are not something that in anyway enhance the actual first hand experience. But I do agree that I was a bit dismissive. People can get great joy out of talking about an experience after having been through it. It can be a sort of puzzle to connect the dots and try and make sense out of everything. So, yes, it is perfectly fine to see the game as meaningful in a retrospective sense if all the pieces fit together. However, and this is what I was trying to get to, is that I approached the game as a experiential narrative experience. I judged the game according to this. You cannot take critique that is meant for a certain way of looking at a thing, and then counter it with a completely different viewpoint. Therefore it is pointless to talk about it. What might be interesting to talk about, and what I did discuss in my reply, is WHY I think that it is better to approach design of a game in an experienced narrative sense, rather than retrospective analytic sense. I even begin the article by going through this choice of viewpoint. Very well said! I also found the person above with a Enter-phobia to be reaching in his/her's explanation of the game's narrative. What do you think of HL/2's narrative? I would like to know your take on Dishonored, what you think about the cohesiveness of the game mythos ? Really enjoyed your write-up, and I agree with you on many of these accounts. Thanks for sharing, can't wait to see how you are able to implement these kinds of opinions into your own projects! Yeah I know, gave it one last readthrough now and fixed a couple of things. Hope it is more readable. I always struggle with how much time I should put on rewriting, especially since my time is so limited. There's still a fair number of mistakes. I'd get a pedantic friend to proof it as I don't know about you but sometimes re-reading something a third time is just too much to handle. A good read aside from that though! You know, Flamekebab, there's a whole school of thought that sees grammatical difference by speakers of multiple languages as not errors at all. Thomas, I understand 100% of what you write, and I don't think you should worry about having "perfect" grammar. Thomas, I totally get you on the time limitations. Obviously no post of yours has ever been unreadable, it's just something that I feel sometimes gets on the way of my personal reading enjoyment, and it's a shame seeing as the message is typically really good. A pedantic friend would probably be a good solution and you might not lose quite as much time (or sanity) as combing over the same text a hundred times. It's actually sad to know that video games are not going to change. Or, at least, AAA are not going to change. Because creating a "huge fantastic scenario" and an "amazing visual story with FX and high quality graphics" are the focus of the AAA industry. And what about gameplay and fun? Well let's talk about this tomorrow, dude, we're working on scenario and visual effect for now. I think that the most frustrating point is to see the potential of those games, to consider HOW they could be novative and really fun. There are so many example of real good ideas and novative game design...but managed in a so bad way (I think that, maybe, it's the proof that people who work on those games are good game designers anyway, and try to change things). But, the fact is that AAA players (not all of them, ok, but many) are looking for scenarios and HD graphics. Fun comes after that. It's not a priority. They can totaly play a games with bugs, bad level design, awful situations, unbalanced enemies...if it's a great licence, it's not such a problem (look at Resident Evil 6). So why should it be a priority for AAA industries? AAA are like blockbusters and fast food: people are conditioned to love it. They buy it, they play it and write great critics about it. And, thus, there is no financial reasons to change. So, there are no reason to change. Even if it's not the right way. Even if it's not really what we call "video game". Great post, Thomas. I enjoy this blog so much. I just finished Bioshock Infinite and had a very mixed experience. I was emotionally moved by so much in the game, and had a lot of fun, but also was very frustrated by many of the things you described. I had a lot of difficulty with the ending battle, mostly because I was just dying to know the rest of the story, and didn't want to deal with an awkward new weapon and waves of uninteresting enemies. (I was also playing with a controller, which I prefer the first time I play an immersive game.) It made me surprisingly resentful rather than receptive as I watched that final narrative, which was far too expository--a fault of other games that still do much more with gameplay as a storytelling mechanic, like Braid. Much of what I loved about the trailers for the game was adapted or lost. However, I am so thrilled that game creators and fans are having these conversations about how games can be better. I see Bioshock Infinite on a different level than I see a game like Amnesia, which is a unified, completely immersive experience. We know that independent developers can make games that are all about experience and story--I'm super excited about Gone Home--so the question now is, what's holding studios like Irrational back? There is so much in Infinite that could be the seed of something amazing, something that would last. I will say that I think Infinite has some of the most amazing music of any game I can remember. I've been unable to stop listening to the covers since I finished the game. What is worst in the game Thomas??? I felt somehow like that about Dishonored, a lot ot dormant potential underneath it all. Any thoughts about it? I started writing something, but it felt like ranting. I would need to think harder and write a longish reply to give a good answer. Short summary: No, it felt a lot more self-coherent and lacked the really interesting bits that Infinite suggested at. Huh. I am not actually sure whether self-coherent is an insult or a compliment? I mean, I would take it as a compliment, on the one hand, and yet saying it 'lacked the really interesting bits that infinite suggested at' seemed to imply that self-coherence is, in some way, a thing to be criticized. As far as the Gameplay goes, well, having not played the game (partially because of hearing arguments so far as to it not being worth the 60 dollars) I can't comment on that, but I do agree with a poster somewhat below that, even if it hurts some theoretical immersion-experience, there is something very satisfying about good combat. I suppose it comes down to everything having a place and a time. Part of the reason why I always felt iffy about Dead Space and games like that, even when I found myself enjoying them. Because the place and time for cool and destructive combat was not in a Survival Horror, since giving someone a gun capable of mowing through the monsters rather...limits the horror aspect. As an MFA student in creative writing, I adored Infinite, but this stemmed mostly from a meta analysis of the game as a fiction text. Having been introduced to the theoretical lens through which you examined the narrative as emerging through play, I see your points as wholly valid. However, I adore the game no less. For me, the elements of play were amusing diversions between dissecting the narrative as literature. It's possible that, as an intellectual, Levine designs from a literary framework (he started his career as a writer, after all), which gives rise to many of the oversites you've enumerated. This is a really thoughtful analysis, and I found it an immensely valuable read, but let's not cast aside the reality that Irrational has taken the populist structure of an FPS and bolted it to a narrative with true artistic power. Perhaps, not as elegant as it could have been, but I just hate to see the kind of sentiments Levine has introduced into video games through Infinite be disregarded because of it's mechanical dissonance. I would also like to point out that it seems to me you have flown through some complaints about characterization ("Instead we just end up with villains without much depth. The game simply points out that both sides can be evil, and that is it") which I think are poorly conceptualized. As a general rule, Infinite characterizes through subtly rather than trafficking in exposition. The game absolutely does not characterize as "evil," but instead unifies all of its present character arcs under a common theme of the lengths one will go to to find personal redemption or to exist in a world where they can accept their own self-image. Comstock, Fitzroy, Booker, Slade, The Luteces, even Songbird can be understood this way upon a careful read (I will concede Booker's character is probably one of the least engaging due to his constant piddling through trash and violence against others without proper motive). Anyway, to point, there's a lot going on in the subtext of the narrative that you're ignoring. Also, I would have tied a millstone around my playstation and tossed it into the pacific if Infinite had attempted to spend any amount of time expounding on quantum technologies or anything of that sort. In my opinion, those were rightfully omitted (we should all be taking a page from Rian Johnson's book when it comes to these issues in the genre fiction of emerging mediums). Also, let me add that your ideas for improving the cohesiveness of the game were great. I respect your work and will continue to be a fan of yours. Thanks for sharing your view. And yeah, as said in an earlier comment, it is possible to get a lot of engagement from the game by viewing it in another way. The big question about your view though, is if its YOU or the AUTHOR that is being really clever ;) For your enjoyment it does not matter, but it is worth thinking about. When one does a "careful read" of something it is very easy to mold things into ways that were not the intention. I know this has happened from our own games, and we have had awesome interpretations of things that were never intentionally added but just comes from the ingenuity of the person doing the interpretation. This is still very cool, but also worth to ponder. Also want to note: Yes thank goodness that the game did not go into any more quantum stuff, I would have like it to exclude it and just to Star Wars. I hate when proper science is used as buzzword techno babble. Another very interesting point to consider is: The game is designed as an FPS from the start. In a way we should really be thankful for any themes beyond "shoot the baddies!". This seems to be pretty much the way you played the game. I have been thinking about this a bit, and would really like to write a longer essay on it. I think there is a sort heritage of just taking shooting for granted in games, and that it essentially has been made into a transparent activity. One does just dismiss the shooting and see it as something that help keep the engagement, almost like some kind of weird song and dance number. @Thomas Why does it have be some sort of competition about who is cleverer? Once an author has created an experience, different people will interpret it in different ways and all of them are right in their own way. BioShock: Infinite is clearly trying to make a statement about narrative in games. There have been some very interesting articles written about the meta commentry in Infinite. No offense, but the narrative of Infinite is much more complex and interesting than the narrative in Amnesia. The narrative in Amnesia was frankly, pretty cliched and not to mention the tacked on endings. There is really nothing much to interpret about Amnesia, not sure what is with people that apparently are. Just checkout the TV Tropes page for Infinite and you'll understand how much though has been put into the narrative. And to mention the thousands of discussions that Bioshock Infinite has spawned with people trying to put clues together and make sense of the finer details. What's this with the competition argument? Tomas writes that it is worth pondering if it's the author/developer that is clever or the player. It certainly should be the author/developer if the work should have any prize. Infinite was to me the typical kind of story where you leave a lot of loose ends to "interpret" which leads to LOADS of discussion and analysis. Does that make it a great story with a lot of depth? It certainly is the kind of story that most easily generates this kind of plot analysis. Oh, man, as much as I liked Bioshock: Infinite, I'm glad I'm not the only one who feels it's lacking on several fronts and felt compelled to write some words about it! (you can check the link in my name if you care!). I was especially disapointed by the game's linearity, the completely artificial NPCs, the reduction of the Shock series into a simple shootingfest and I felt that Elizabeth became not much more than a robot during gameplay too! I have to agree unfortunately, I played it and have stopped. Lost interest. Agree on most of it. I think what the game basically did was to try and change the way the 'large audience' thinks about shooters, and thankfully, I notice people are slowly getting over many fps games simply because the story and game play are all so generic. My main point is as you said, the exaggerated violence is unneeded and I think most people think this, but I think this is what Infinite is about, to change the way that the 'large audience' thinks about shooting and violence in games. On one side you have Elizabeth the 'nice' character, and on the other, Beckett, the bloodthirsty murderer, which is what most FPS characters are. Just think, what would the game be like if you played as Elizabeth? To me, Infinite just seemed 'unfinished'. Here is a movie with all the combat parts edited. NOW is like Dear Esther. Excellent critique. I don't think the major studios will change. There's too much money riding on AAA titles for anyone to risk a game that deviates from the familiar formulas. I think the only hope for different play experiences is for them to bubble up from the indie scene. I agree and disagree on the combat. I thought it was excessive, but I feel removing too much of it would leave a hollow shell (a very nice shell but hollowed out none the less). Dear Ether was a nice experience, but that's because there's not many other 'games' like it. In my opinion, Bioshock Infinite needs combat. But it needs to be done more sparingly. It needs to feel like you're combating with actual people who are trying to murder you. As it stands it feels like you're being attacked by mindless automatons. That's not to say mindless combat is always bad, I've recently enjoyed "FarCry 3 Blood Dragon". But combat should only be used as much as the game requires, and BioShock infinite could certainly have done with less "pew pew" and more NPC interaction. Isn't it about time that you guys put up some more Machine stuff, like a clip? It's been 5 days since I made that comment, and when I today, finally check back, you've given nothing but an oink and attempted to make a face that vaguely resembles that of a pig? When we know more we will say so, promise! Right now there is nothing I can say about release. Hm, I was sort of thinking about what your next game was going to contain, and I was sort of hypothesizing/hoping that your next game would contain more detailed and more in-depth environments that is rewarded to the player through curiosity and the urge to explore like bioshock infinite did in the first 10-30 minutes of the game that feels constantly fresh. I strongly feel like that sort of design would work really well with your style, I really feel like it could add quite a lot to your games if you put the time into it. I feel like in a way you could really one up it, due to the nature of your design practices already. You really give the player space to feel things, and with that nature of that game play you could seriously take stuff far with that sort of environment design. Is it okay if I ask if you are working on that sort of thing? I remember reading an article that talked about how you were trying to take an "evolutionary leap" in your next game. This was a very thoughtful article, Thomas, and I respect, but don't agree entirely with, your premise. I agree that BioShock Infinite could be a very interesting game without the combat. However, I don't think it would be a _better_ game without the violence; merely a different one. One may ascribe it to some inherent character flaw or mental condition, but I actually like violent games. I also like philosophical games. May I really only have one without the other, or is possible to have both? I enjoy games where I have to no way to defend myself against the hostile beings inhabiting the game world (like Amnesia). I occasionally enjoy puzzle games too, although I typically satisfy my desire to solve problems via my activities in "real life." I don't typically enjoy purely narrative games like Dear Esther, but I can at least see how they can be appealing to people. But sometimes I like to be empowered and set against hostile forces with only my wits and reflexes to garantee my survival. That's not a horror game or a Dear Esther game to be sure, but I do find such experiences to be fun, and that's just as important as telling a strong narrative. Conflict and anger is just as much a part of the human experience as fear is or exploration and awe. Of course, while conflict may be inescapable, in the modern world it's usually intellectual rather than physical. That said, there is something primal about physical conflict and imperilment. H.P. Lovecraft (with whom I am probably more obsessed than I have any right to be) may have correctly pointed out that the "oldest and strongest emotion in mankind is fear," but the second oldest and strongest emotion may be aggression. Even so, while I may enjoy the adrenaline rush of a fight for survival, I need for the violence to be meaningful. This is why I don't enjoy games like Gears of War or Call of Duty. (This is not to bash people who like those games, it's just that I personally don't find them to be philosophically stimulating enough.) But this is what I love about the BioShock games: things blow up and my mind is blown too. I'm not going to argue that the combat in BioShock Infinite couldn't have been better integrated into the story (personally I think the original game did a better job of this) and I agree that game experience is usually enhanced when this the case, but it was precisely the kind of game that I wanted to play. I know you feel frustrated by the potentially awesome first-person adventure game this game could have been, but i think that Ken Levine made exactly the kind of game he wanted to play: violence and all. Honestly, I also want the medium of gaming to give rise to many more varieties of games than exist today. But I also want violent games to be accepted upon their own terms rather than dismissed by the non-gaming public just because they are violent. This isn't what you argued, but the truth is that when someone is injured or killed they bleed, and I find it hilarious but also saddening that while some games go overboard even realisically depicting violence for the horrific and gory thing that it is derided as "ultraviolence" while unrealistic consequence-free cartoon violence is given a pass. I think that wonderful and meaingful narratives can written not despite violence but because of it, just as they can be without it. And while BioShock Infinite may have fallen short, it did enough right that it was not only very fun for but holds a special place in the heart for people like me. amazingly intersting to hear your thoughts on games like this. would love to read a review about "The Last of us"! I AGREE 100% with everything that the thread starter said. I hate Irrational for this game! period. This game could have been infinitely better! I finished it recently and i am just so disappointed with it. This game paves the road for what we can expect from irrational and 2k from here on forward. 1)I think the combat was part of narrative. After many of the battle Elizabeth constantly questions Booker. And through these conversation you learn about both ofthem. It also help strengthen and carry the theme of redemption. While I understand your opinion about the combat, I think the way I experinced the combat was actually as part of the story rather than just a gameplay mechanic. Like this is the first game where I felt guilty for killing foder and actually on some subconcious level didn't like myself/protaganist. By the end I felt like I understood why the only to end Comstack was to end Booker. this is a little too text book. Given the fact that we don't exactly know what makes a good game and since the actual experience of playing game is complicated I don't think you can just apply this fact as if apply when ever violence is present. One of the coolest things about Infinite was the lack of true villains. You can point the blame in many directions but because of the multi-dimension element you can see that there are many possibilities when it comes to villains. This is the problem with tackling dimensions, just as it is in scientist tackling the theories today. There are so many possibilities that at some point (or dimension) everyone is going to be a root to a problem. I love how Infinite made so many people a root, rather than sticking to one bad guy.